In 2010, Beaverton was named by Money magazine as one of the 100 "best places to live", among smaller cities in the country. Along with Hillsboro, Beaverton is one of the economic centers for Washington County, home to numerous corporations in a variety of industries. According to Oregon Geographic Names, Beaverton's name is derived from the settlement's proximity to a large body of water resulting from beaver dams. The area of Tualatin Valley which became Beaverton was originally the home of a Native American tribe known as the Atfalati, which settlers mispronounced as Tualatin. The Atfalati population dwindled in the latter part of the 18th century, and the prosperous tribe was no longer dominant in the area by the 19th century when settlers arrived. The natives had a village called Chakeipi, meaning Place of the Beaver, and early settlers referred to it as "Beaverdam". Early settlers include the Hall Family from Kentucky, the Denneys who lived on their claim near present-day Scholls Ferry Road and Hall Blvd, and Orin S. Allen, from western New York. Lawrence Hall purchased 640 acres (2.6 km2) in Beaverdam in 1847 and built a grist mill with his brother near present-day Walker Road. His was the first land claim in the area. He was soon followed by Thomas Denney in 1848, who came to the area and built its first sawmill. In 1860, a toll plank road from Portland to Beaverton was completed over a trail called Canyon Road. After the American Civil War, numerous other settlers, including Joshua Welch, George Betts, Charles Angel, W. P. Watson, and John Henry, laid out what is now known as Beaverton hoping they could bring a railroad to an area once described as, "mostly swamps & marshes connected by beaver dams to create what looked like a huge lake." In 1872, Beaverton's first post office opened in a general store operated by Betts, who also served as the first postmaster of the community. Betts Street, where the current post office now stands, is named in honor of him. In 1893, Beaverton, which by that time had a population of 400, was officially incorporated. Alonzo Cady, a local businessman, served as the first mayor. Many major roads in Beaverton are named for these early settlers. Beaverton was an early home to automobile dealerships. A Ford Motor Company dealership was established there in 1915; it was purchased by Guy Carr in 1923 and over the years Carr expanded it into several locations throughout Beaverton. There are still several dealerships near the intersection of Walker and Canyon Roads. In the early 1920s, Beaverton was home to Premium Picture Productions, a movie studio which produced about fifteen films. The studio site was later converted into Watt's Field and associated aircraft manufacturing facilities. A second Beaverton airport, Bernard's Airport, was later developed farther north, at the present location of the Cedar Hills Crossing mall. The town's first library opened in 1925. Originally on the second floor of the Cady building, it has moved repeatedly; in 2000 it was moved to its current location on Hall Boulevard and 5th Street. A branch location was opened for the first time in June, 2010, when the Murray-Scholls location opened near the Murrayhill neighborhood. The Beaverton libraries and 15 other local libraries participate in the Washington County Cooperative Library Services. In the 1940s, Tualatin Valley Stages, a division of Portland Stages, Inc., provided limited bus transit service connecting the city with downtown Portland, operating later as a separate company, Tualatin Valley Buses, Inc., through the 1960s. This was one of four privately owned bus companies serving the Portland metropolitan area which became collectively known as the "Blue Bus" lines. All four companies were replaced in 1970 by TriMet, a then-new regional transit authority, which expanded bus service to cover more areas of Beaverton. In the late 1970s, a light rail system was proposed to connect Beaverton to downtown Portland, as part of Metro's plans for the region's transportation. In 1990, voters approved funding for Westside MAX. Construction of the line began in 1993 and was completed in 1998. Six stations are located within the city of Beaverton: Elmonica/SW 170th Avenue, Merlo Road/SW 158th, Beaverton Creek, Millikan Way, Beaverton Central, and the Beaverton Transit Center. All but the last of these (the transit center) are located along right-of-way formerly owned by Burlington Northern Railroad and originally by the Oregon Electric Railway, which provided interurban service through Beaverton until 1933. The present-day light rail service (MAX) is operated by TriMet, which also continues to operate several bus routes serving Beaverton and the surrounding communities. Since early 2009, Beaverton has also been served by commuter rail service, TriMet's Westside Express Service (WES), running south to Wilsonville via Tigard and Tualatin. 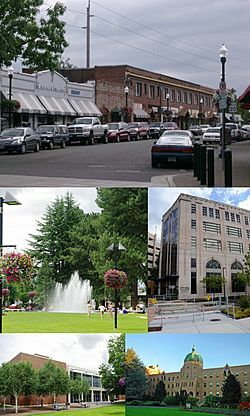 In December 2004, the city and Washington County announced an "interim plan" which would lead to Beaverton becoming the second-largest city in Oregon, second only to Portland. The "interim" plan actually covered a period of more than ten years; from the county's perspective, the plan supported its strategy of having cities and special districts provide urban services. The city of Beaverton also attempted to annex certain businesses, including Nike, which responded with a legal and lobbying effort to resist the annexation. The lobbying effort succeeded quickly, with the Oregon Legislative Assembly enacting Senate Bill 887, which prohibited Beaverton from annexing Nike without the company's consent. The bill also applied to property owned by Electro Scientific Industries, Columbia Sportswear, and Tektronix, and in August 2008 the Oregon Land Use Board of Appeals ruled that the bill also barred the city from annexing property belonging to Leupold & Stevens. (See below, under Economy.) Nike's legal efforts to resist annexation cost Beaverton taxpayers over $360,000 as of July 2006[update]. The Oregon State Legislature has also passed legislation which redetermined Washington County's urban growth boundary to include more development. The city has tried to encourage transit-oriented development around the city's MAX Light Rail stations. The Round, a mixed-use development around Beaverton Central MAX Station on the site of a former sewer plant, was originally announced in 1996. It is only partially complete, due to the bankruptcy of one developer and the Great Recession. In 2014, the City of Beaverton moved its city hall into a vacant office building in The Round. Further development and an arts center have been proposed for the former site of the Westgate Theatre, adjacent to The Round. According to the United States Census Bureau, the city has a total area of 18.73 square miles (48.51 km2), all land except small creeks, ponds, and lakes. As of 2000 the median income for a household in the city was $47,863, and the median income for a family was $60,289. Males had a median income of $41,683 versus $31,204 for females. The per capita income for the city was $25,419. About 5.0% of families and 7.8% of the population were below the poverty line, including 8.5% of those under age 18 and 6.8% of those age 65 or over. As of the census of 2010, there were 89,803 people, 37,213 households, and 21,915 families residing in the city. The population density was 4,794.6 inhabitants per square mile (1,851.2/km2). There were 39,500 housing units at an average density of 2,108.9 per square mile (814.3/km2). The racial makeup of the city was 73.0% White, 2.6% African American, 0.6% Native American, 10.5% Asian, 0.5% Pacific Islander, 8.2% from other races, and 4.5% from two or more races. Hispanic or Latino of any race were 16.3% of the population. There were 37,213 households of which 31.0% had children under the age of 18 living with them, 43.7% were married couples living together, 10.6% had a female householder with no husband present, 4.6% had a male householder with no wife present, and 41.1% were non-families. 30.9% of all households were made up of individuals and 8.5% had someone living alone who was 65 years of age or older. The average household size was 2.39 and the average family size was 3.03. The median age in the city was 34.7 years. 22.9% of residents were under the age of 18; 9.2% were between the ages of 18 and 24; 33% were from 25 to 44; 24.5% were from 45 to 64; and 10.4% were 65 years of age or older. The gender makeup of the city was 48.6% male and 51.4% female. Beaverton, Oregon Facts for Kids. Kiddle Encyclopedia.